Directions: Turn at the stop light at Rivermont Ave. and Rivermont Terrace and follow to Langhorne Road. Turn left to Landon proceed to the first house on the right (facing Landon) Watch for signs! 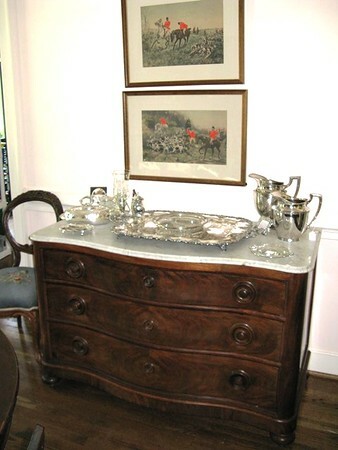 Sale includes a large and varied collection of antique furniture and decorative accessories most of which were brought from Alabama to Lynchburg by Mrs. Craddock’s family when her father, Dr. Theodore H. Jack, became the president of Randolph Macon Woman’s College in 1933. Includes numerous Classical Revival (Empire) pieces as well as Rococo Revival, Elizabethan Revival, Renaissance Revival, Eastlake, and earlier, antique and modern oriental rugs, sets of early 19c to late 19c chairs, lady’s and children’s vintage clothing from the late 19c to the mid 20c, fine pieces of American Brilliant Period cut glass, R-MWC Wedgwood plates, antique cast iron patio furniture including Lynchburg Foundry benches, and much more. This charming house is very full with undoubtedly something for everyone.